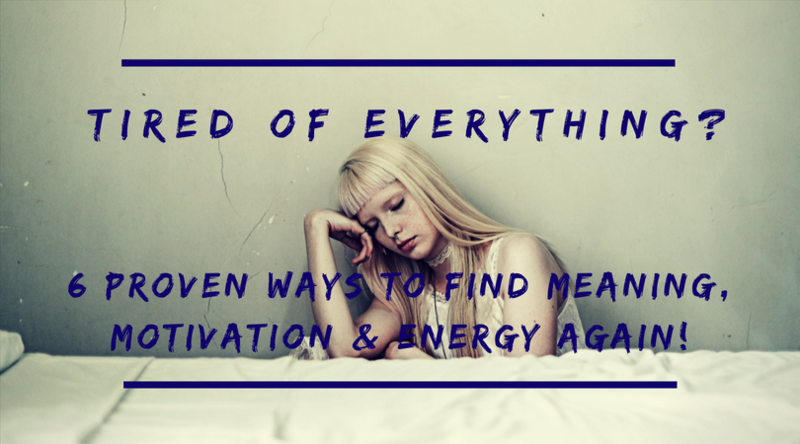 I'm Tired of Everything: 6 PROVEN Ways to Find Meaning, Motivation & Energy Again! 1 Why do we get tired of everything? It was 2011, and I was staring at my bedroom wall. My mind was empty. But not empty in a clear, focused, meditative way. It was just dull. It was like someone had gone into my brain, turned down the colours and muffled the volume a little bit. The thought of standing up and going to make lunch was weighing down on me. Literally. The idea itself felt heavy. It physically felt like getting up to prepare some food was going to take all the strength I could muster. I was tired. I was just so tired of everything. I picked up the phone to call a psychologist. I couldn’t do this anymore. It rang once – I quickly hung up. “I don’t need any help!” I naively told myself. But I did, I definitely did. It was about to be the worst week of my life. I picked up the phone again, it rang twice – I hung up. Again I dialled the number. It rang once. Twice. Three times. Actually, I’ll come back to that in a second…. Let’s go back. Well, forward I guess. Let’s go forward to what I know now, and back to what I was missing then. Why do we get tired of everything? Typically, when we’re tired of everything, it’s not because of one single event. It’s usually the effect of a number of different experiences or situations. The cumulative weight of each of these saps our lifeforce and they require that we go about making changes to restore balance. Most of these changes are small, and some, where necessary, are big – and all of them make a difference. The following 6 suggestions are the most important to consider when you’re tired of everything. When we get tired of life, one of the mistakes we can make is to compare ourselves to others. It’s easy to look at those who appear motivated and driven, and start to wonder why the same attitude doesn’t come so easily to us. If we take this a step further, we may believe that other people have some huge meaning driving their actions, and even this is exactly where we’re lacking. The last twenty years have seen media and entertainment littered with the message that we all need to find passion and purpose. We need to do something meaningful and leave an imprint on the world. Not only is this idea unrealistic, but it can create a lot of anxiety. Telling someone they need to find a world-changing passion to get them out of bed in the morning is like telling them they need to drink a $400 bottle of Kona Nigari Water every time they need quench their thirst. Maybe there are a handful of people out there actually doing it, but you’ll get almost the same result by continuously sipping filtered tap water. So what should you do? Find micro-meanings. This means you find something that is meaningful ‘enough’ to drive you to the action. Nothing more. You don’t need to be driven by a purpose that will hold value over your entire lifetime, you just need something that is worthy enough of taking the first step. Apply for one new job because there is enough purpose in the potential pay increase to submit the application. Start a diet for one day because you’re motivated enough to see how it goes. Go for a ten-minute run today because you’ll feel better after getting outside. It’s very rare that someone who is successful and driven found a purpose that lit a fire under them overnight. What happens 99% of the time is that these people have built momentum over years and years by continuously focusing on what was right in front of them. Find a micro-meaning that is enough to take the first step towards building momentum – don’t look for a magic reason to change your situation. List 5 things you want out of your life right now. Break them into the smallest possible step you can imagine. Write down why you would be motivated to do each of these 5 tiny-steps. Choose one to do immediately. We are both physical and mental beings. A lot of the time when we say we are tired of life, we do so with the conviction that it’s impossible to find meaning or purpose in our situation. The reality, on the other hand, may just be that our bodies and brains are simply in need of rest. There are a number of ways to improve your energy levels. A lot of the time when we get sleepy during the day, it’s because we aren’t respecting our bodies natural rhythms or we are eating the wrong kinds of foods, or more commonly, too much food. Counterintuitively, restricting your diet with intermittent fasting can improve vitality by reducing the amount of energy our digestive system needs to spend. To look at these in more detail, check out this article on supercharging your energy. Track your energy level every 3 hours for 3 to 7 days (the longer the better). You can simply write a number out of 10, and if you’d like, 1-2 sentences about how you feel if you’d like. Pick ONE thing that you could do to replenish your energy levels. Introduce this new habit and continue to track your energy levels for 7 days. Watch for a difference, and if you don’t find it helps you can leave it be. Though do your research, some changes may take longer for the benefits to kick in. Keep trying new things every week and seeing what works best for you. Only try ONE thing at a time to ensure that you know which change is having a positive impact. There’s a good general rule when it comes to what you want in your life. The more an idea is talked about by a mass audience, the more it becomes shrouded in ambiguity and the more we lack a clear definition of what it truly is. The result is that we may end up chasing something that we 1. Don’t understand and 2. Wouldn’t want if we did understand. Unless we define these terms clearly, we may not actually know what we want. To one person happiness means having a stable situation and avoiding excessive negative emotion, to another it means having an abundance of rich experiences, even if that means a lot of stress. To another, health may mean being comfortable with their body image, competing at a high level in their sport, or simply avoiding regular illness. Who is to say that that’s the case? A significant part of our drives as humans are social, and we’re constantly being influenced by one another. It’s clear then that there is already a lot of ambiguity around the idea of motivation. So let’s define motivation as it relates to being tired of life. A very simple and clean definition is that motivation is a reason behind your drives and actions. It’s very common for someone to say ‘I’m not motivated” but that’s somewhat of an oxymoron, because, using this definition, to move is to be motivated. Even in the deepest of depressions a part of us still motivated to breathe air and go to the bathroom. You’ve been motivated enough to read this article this far. So you need to find the reasons behind your actions. What you really mean when you say “I’m not motivated” is that you’re not driven by what you would like to drive you and in the direction you would like it to drive you. What do I want to be motivated to do? How can I emphasise the reason behind that motivation? What do I want to be motivated to do? I want to be motivated to go for runs five days a week. Why do I really want to be motivated to do that? So I can feel healthy. Why do I really want to feel healthy? So that I can feel confident at work. How can I emphasise the reason behind that motivation? Write down five ways in which confidence can improve my life and five ways that I’ve displayed confidence in the past. Remember that a lot of untangling motivations comes down to clarifying what we want by repeatedly asking questions. We are motivated by dozens or even hundreds of different beliefs or ideas that we have about the world, and once we are more aware of these, we can use them to our advantage. The human brain, in some ways, functions like a camera. We’re constantly needing to zoom in and out, depending on the context, to make sure we get things done. For example, when you’re at work, you need to act in a way that the project you’re working on is the number one priority in your life, otherwise you won’t dedicate the time and energy to it. However, this doesn’t mean it is the number one priority, it doesn’t mean its more important than your family for example. Imagine a businessman who dedicates a lot of time to his job, to provide for his family. He succeeds and they live a comfortable life. But he’s still so zoomed in on the work, that he’s lost perspective around how important his family is, and he unknowingly starts to neglect them. Sometimes we simply lose sight of what matters. We focus on our body image because we know it will improve our confidence, but then we improve our body image, become slightly more confident, but continue to be focused on improving how we look. The same thing happens with worries and concerns we ruminate on. Do I feel passionate enough about my life? These are valid concerns to have in certain moments, but we need to ‘zoom out’ every once in a while and place them in the context of our entire life. Write down three things that are frustrating you about life right now. Try to look at things that you’ve focused on for a long time and may have lost perspective over – the more time we spend on something, the more we tend to lose perspective. People rarely understand just how important structure is to energy levels. When we don’t have a solid structure or schedule, it’s hard for our bodies and brains to know when to exert energy and when not to. When you don’t wake up at the same time every day, or you inconsistently take naps during the afternoon, this can be very detrimental to your body’s natural rhythm. We see this commonly with people who want to retire, but when they do so and their days no longer have structure, they may have an emotional slump. At the end of each day, write down three things you NEED to do tomorrow. If you’re not currently employed, these can be absolutely anything, but you need to take them as seriously as you would an important work project. Split your day into three sections, all focused on these activities. Fill in the gap with smaller activities. Finding love doesn’t necessarily mean falling in love in the Disney-esque romantic sense. You don’t want to simply find another attachment. My definition of love is that it covers three things. Attention: when we love something, we direct our attention towards it and become aware of its subtleties. Affection: the object of love receives positive emotions from us. Action: we act in a way that expresses our love. If you can find a partner that you love, great. But you can also begin to practice loving what you already have in your life; sports, music, relationships, hobbies, foods, movies etc. If you love cooking, you will: 1. pay close attention to the ingredients as you prepare a meal, 2. do so with a good attitude, 3. make cooking a priority in your life. If you love your children, you will: 1. Pay close attention to your children, their likes and dislikes, 2. Express affection towards them, 3. Act in a way that is in their best interest. When we are in love with our work, relationships, or hobbies, we fall into the flow state more naturally and more frequently. 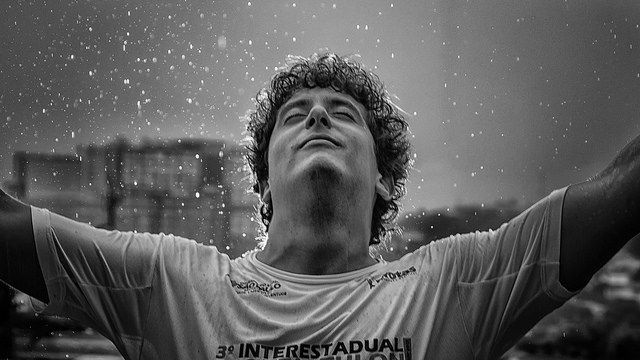 In fact, the flow state has been found to be one of the most significant predictors of a happy life. Finding something to fall in love with is probably the most difficult task on this list. However, there are a couple of things you can do to make it come a little easier. Be open-minded. When something interests you, give it a try. A lot of the time we don’t realise how much we will enjoy something until we have some experience with it. Practice concentration meditation. This will help you accumulation new knowledge and skills quicker, and fall into the flow state more consistently. Commit to something. Some things we don’t like at first simply take time, commit to something for a few weeks and if you don’t like it, try something else. Learn How I Overcame the Worst Week of My Life by using one of the sharing buttons below! So where were we? Oh, that’s right. But before anyone could even answer, my pride swiftly returned. I hung up. “I don’t need ANYONE’S help!” Yes, I did, yes I definitely did. My parents were going through a separation, I was three years into a degree that I realised I didn’t want, I had an active social life but was feeling incredibly lonely, I had no idea what to do with my life, and persistent injuries were keeping me from exercising. I didn’t book the appointment with the psychologist that day. But I needed it. A lot was going on in my life at the time. I was barely coping. And then the straw that broke the camel’s back. 24 hours after I hung up that phone, a friend of mine was in a car crash – and he didn’t make it. It was a shock to the system that I couldn’t seem to shake. My emotional wellbeing seemed to spiral down. I couldn’t focus at university, I wasn’t hungry, I was exhausted, I was getting headaches and stomach aches, and I was extremely tired of my life. I spent six months I was just going through the motions. In the end, I did see a psychologist (but that’s a story for another day), and I managed to get enough momentum to pull myself out of that slump. I didn’t find real love in this time, but I read a book by Stephen Batchelor called Buddhism Without Beliefs, which would spark my deep interest in spirituality and completely change the way I saw the world. These examples may not work for you, but if you can apply these principles to your own life, you’ll be able to find new energy and vitality that can help to turn around feelings of exhaustion and get the necessary momentum to change your life. a correspondence more about your post on AOL? I need a specialist in this space to resolve my problem.